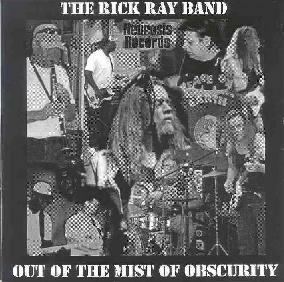 Rick Ray - "Out Of The Mist Of Obscurity"
Rick Ray amazes me. I have only heard one other of his CDs and it is quite excellent stuff. This is Rick’s most recent CD and his 27th since 1999. Yes... that is right, 27 releases since 1999. The man must live and breath music and every musical idea he has must get committed to tape. One would think that the guy would run out of ideas or recycle himself or just plain release some crap. While I have not heard all 27 releases (I would like to! ), the material on this CD is really excellent. Shredding guitars, heartfelt playing and sometimes plain spacey. A little bit of Trower, Frank Marino, but mostly himself is what you get here. Some powerful and perhaps a little bit too religious lyrics on most tracks. He is backed by the excellent clarinet and saxophone playing of Rick Shultz. If you have never heard any of Rick’s CDs, this would be an excellent one to start with.